The wet weather is slowing down the boat building. After one day of sunny Spring weather we seem to be back in the depths of Winter. 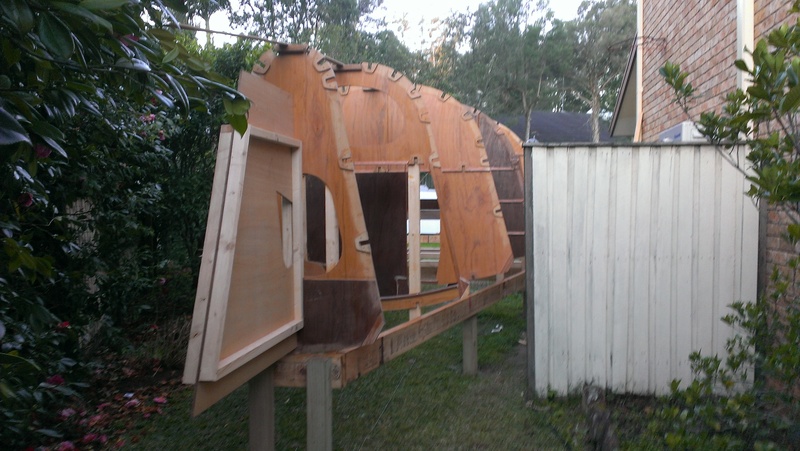 Fortunately there are no deadlines with the boat building and there are still some task that can be undertaken in the relative comfort of the garage. Today was wet with some particularly large raindrops but these stayed away for the whole of the RANSA Winter Wedneday race and only returned when it was time to disembark the crew. How lucky can one be to have crew who will sail in the conditions forecast for today and I am thankful the rain stayed away and the wind made for some interesting racing. 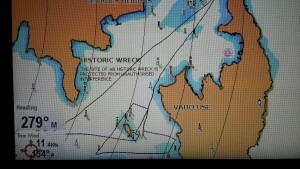 The reach to the heads was tighter than last week so we did not do quite as well and were mid fleet at the rounding. 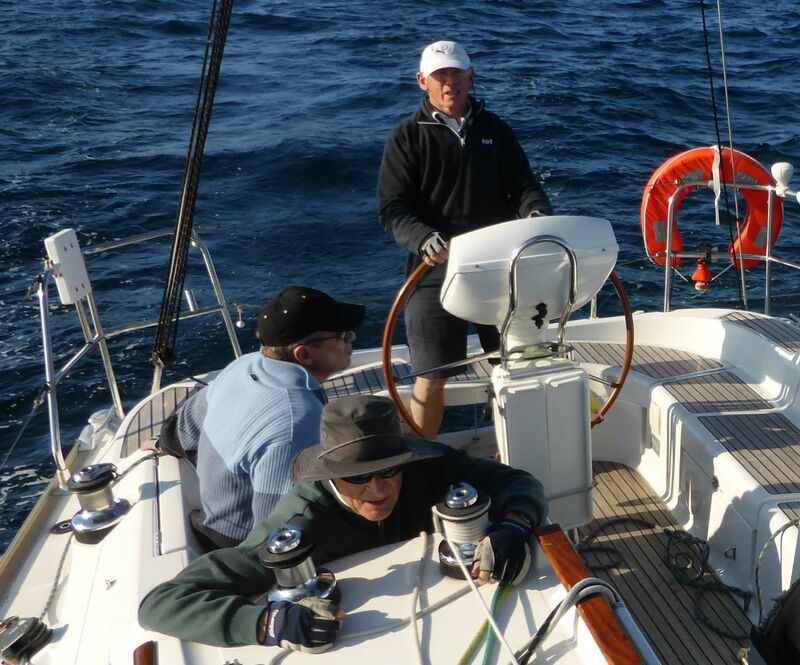 The Northshore 38′s L Eau Co, Rainbow and Izzi performed well and were well up at the turning mark. 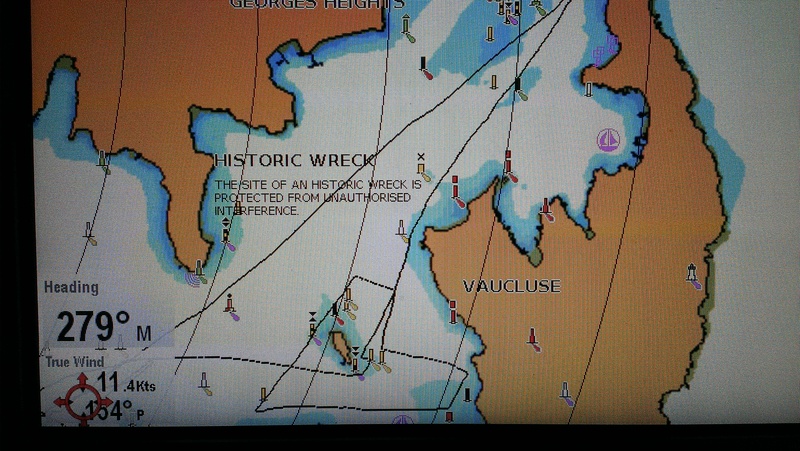 Just before rounding we had put in the reef without losing a place. 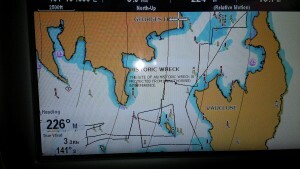 Graham had presumed we would tack on the mark and had taken the winch handle off the genoa winch so tack we did. This was a good move as it was not a tight beat and we were able to work out from under the yacht that had carried into the shore. By Steel Point we had climbed in front of Izzi and had watched as Enigma dropped below our stern. Into Rose Bay we were lifting inside Rainbow and looked to be ahead until headed. After tacking in the lee of Rainbow we watched her lift up in her private lift while we drifted away to leeward and we never caught up this lost ground. We held our position to windward except for the long waterline 40 ft Hanse, Crackerjack to which we gave rounding room on the Rose Bay mark. From there she used her long waterline length to advantage to pull away by a minute at the finish. Our approach to the finish was hampered by the leading Division 2 yacht Syonara which is a similar size and while we are quicker we are not fast enough to be able to sail through her lee and there was no way she was going to let us go over the top. Considering the limited amount of windward working we did well to finish sixth on handicap just a minute and a few seconds behind Rainbow. Viva won the day as she revels in the fresh conditions and as Kevin said if Viva could not win on a day like today her handicap would be wrong. The other bright note is that we beat Larrikin and Luce Change around the course. Gwhizz managed a fifth on handicap showing that their handicap is now about right and they should have a better chance on point score next year. 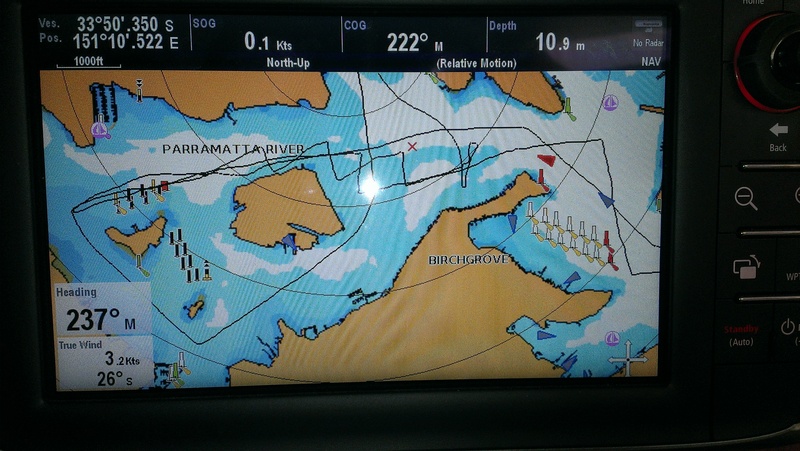 There is not much action to show with the tracks today but it does show how far off a beat was the work back to Steel Point and how much we were able to point up as we sailed into Rose Bay. Kevin and I had great difficulty seeing the difference between last weeks exceptional tacking angles into Rose Bay and this weeks. True this copy cat performance was with an incoming tide while last week it was against the tide but it was a good performance never the less. 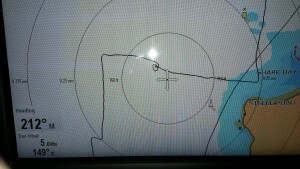 I have to confess to one mistake when tacking into Rose Bay I saw the yachts ahead lifting on starboard tack and tacked early in anticipation of the shift but it was only a bullet coming across the course and it never reached us. Rainbow who was a little ahead lifted into the gust while we dropped away to leeward. That one error and an unhelpful becalming at Point Piper put paid to our chances of second place but we still managed a good fourth on handicap. Back at the beginning we made an excellent start behind only The Biz who we soon rolled with our full main and No 2 Genoa in winds gusting up to twenty knots. The downwind leg was our best performance ever as we were ahead of such stars as Allego and Luce Change at the turn. Izzi had a spectacular broad reach and Rainbow was not far behind her at the rounding. We soon pulled in Izzi even as we reefed the main. So well did the reefing go that we lost no one and pulled away from the following pack with the help of a bit of a lift on our side. Rainbow battled on under full rig just ahead until the above mentioned mistake I made in tacking early. I think she was also helped with the full main as the breeze was lighter in Rose Bay so we shook out the reef as soon as we rounded the mark. It was the last tack into the Rose Bay mark that allowed Allegro to slip through but this is the first time we have been up with her all the way to Rose Bay. At this stage I felt we were ahead on handicap of everyone except Rainbow and we were until we reached Point Piper and were becalmed. It seemed to take forever for the wind to return and while we waited the rear guard were steaming along in fresh breeze. There was wind just to windward but we had the genoa poled out and could not go up to the line of breeze. 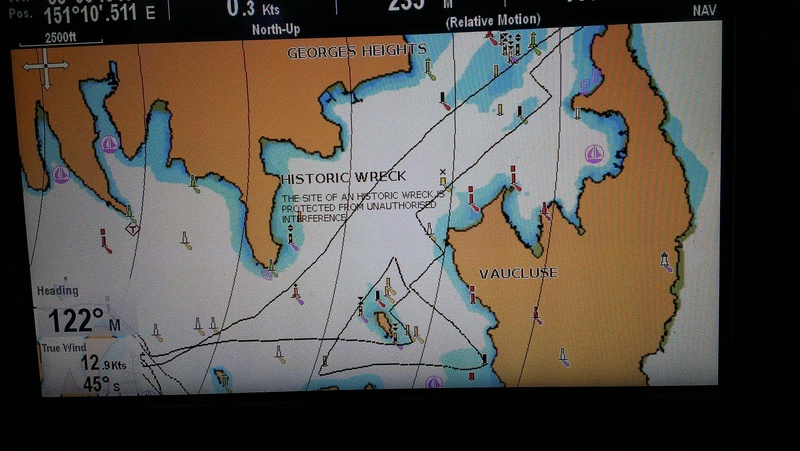 It was here that Izzi recovered some ground lost on the windward works and Enigma made big inroads into our lead. On the run Geoff spotted Krakatoa tacking back towards Shark Island and suggested that was the way to go. 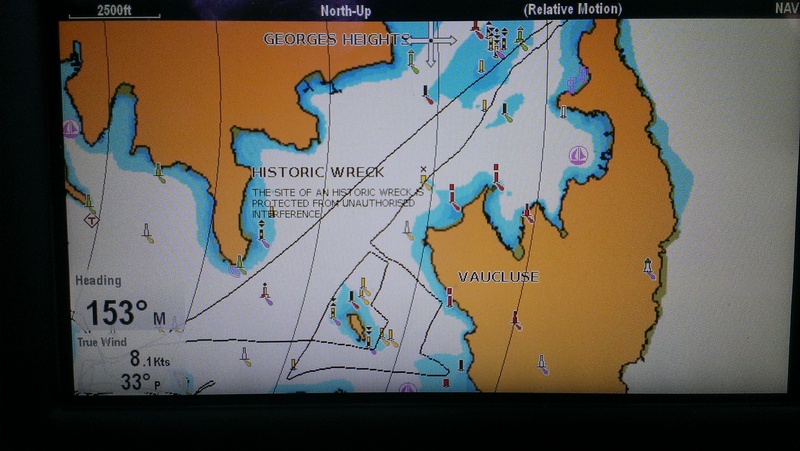 As we rounded the mark for the beat around Shark Island wind and tactics and strategy dictated we follow Geoff’s advice which recovered a little ground for us and we rounded for the reach home still in front of Luce Change. Hopefully the second place last week and the first this week will bring Rainbow’s handicap back so we will not have to give her time again but we will have to wait and see. Izzi’s magical streak continues as she gets better every week. The weather was perfect for a dash around the harbour and the tacking angles on the short beat up into Rose Bay magical birthday presents but we fell 21 seconds short of the third place I had expected as we crossed the finish line. In that 21 seconds Allegro, Trim and Enigma slipped in to relegate us to a slightly disappointing sixth place. Our fastest times place deserved a better result. Our sixth fastest in a fleet of fifteen yachts is possibly the best position we have had in the seven or so years we have sailed at RANSA and due in no small part to the above mentioned tacking angles. The consolation prize was yet another victory over Rainbow, L’EauCo and Viva, all our old and new benchmarks. What is more pleasing is that the reach up the harbour is not our strong point but on the work back we shaved the marks with surgical precision and left no wasted time or distance on the course. A big thank you to the crew for a great day on the water. For the last race of the West Harbour Winter Series a full complement of crew turned up to try to win the series. With a competent race we finished sixth on handicap and maintained our position one point behind X-Ray. Our place was equal to our previous worst place and X-Ray dropped their eleventh place but we were both beaten by Luna Sea who had an average place awarded for the previous race and with that came to the fore. At the finish of shortened course race there was just 60 seconds between third and our sixth on handicap so where did we lose a minute. Perhaps the first place was the spinnaker reach back along the Hunters Hill shore was worth 30 seconds where I was reluctant to set the big spinnaker until the reach broadened. Those who struggled with the kites early were able to sneak away as soon as the wind freed up while we still had to set the spinnaker. The next place where we lost a little was the beat back up the Hunters Hill shore when we did not pinch above Gwhizz but went below looking for a knock. A knock was not to be found and instead Macscap lifted above us from behind while GWhizz skipped away. So the result was more about choices rather than performance. The tracks show how the outgoing tide influenced the tacking angles especially in the gap between Cockatoo Island and the Hunters Hill shore where the wind is light and the tide strong. I have enjoyed the Winter Series but it is now time to get our the Laser and start to build some small boat condition ahead of the Summer season. We had a very pleasant afternoon on the harbour with sunny skies, a cool breeze and plenty of action to keep us occupied for the race. Our day was probably saved when Ian suggested that we get back to the start line. This keen observation of the dying breeze meant we got back to the line with seconds to spare while many in the fleet were late to start and had a painful day at the back of the fleet. Up at the pin end of the line it was not much fun compared to the lower boat end where Allegro, Luce Change and Silky started. We were sitting on the line with little breeze and what little breeze we had was all over the shop while below Allegro was steaming away close hauled. Eventually the north east breeze filled in and we commenced tacking towards South Head. Courtesy of our more timely start we had the company of Trim and Krakatoa for a while. Krakatoa the all carbon flyer in the fleet picked on shift on the shore better than we did and passed by a long way off. Trim kept us company for much longer being on the same side of the course and not picking any great shifts. Our real problem for the day was how to do a fast 720 degree turn to exonerate ourselves from an unlucky port and starboard. We were going to cross The Biz by a good boat length when we were headed and they pinched up rather aggressively rather than holding their course. Now I think this was their undoing for the day because it caused them to tack away from the lifting breeze onto the rather nasty header we were experiencing. For our part we should have tacked early and then would also have been on the lifting tack and probably a couple of places higher up the finish order. From here we made up a lot of ground to pick up Izzi and close the gap on The Biz. 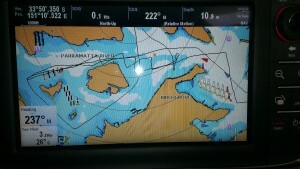 The beat around Shark Island was a good one as we tacked right on the lay line and made good ground on The Biz again. In the lee of Shark Island The Biz made another poor decision and match raced a fellow Etchell right up into the wind shadow where they parked allowing us to reach away lowed down and pick up two places. Izzi sailed well on the reaching legs to be right behind us at the finish and Enigma also made up ground. Meanwhile back in the fleet the unlucky sailors who did not have Ian’s advice to get back to the start line were struggling home. Rainbow, Crackerjack, GWhizz and Star Ferry all had very ordinary days and finished at the back of the handicap list. For our part the eight place was a fair reflection of the good start, the 720 penalty and the good finish and in the big fleet in light conditions an eighth is a good result.